Walking into Firefly for the first time. It really pains me to say this, but I fear that, I’ve discovered that I simply may not be a music festival person. I’d never been to a music festival. 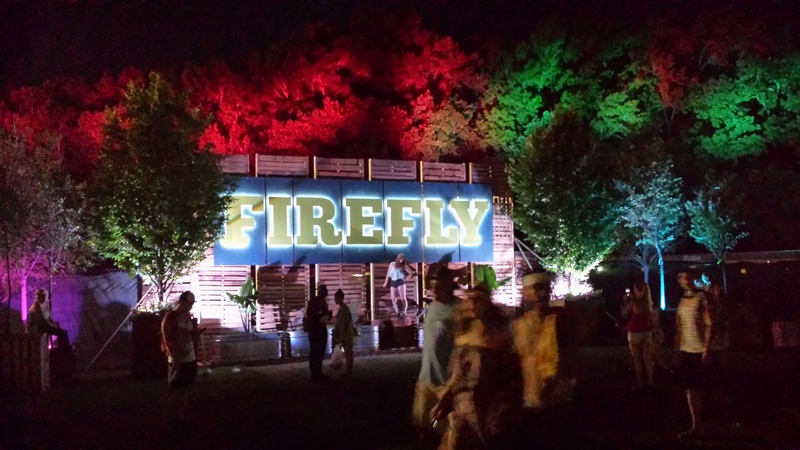 I planned on attending the 2015 Firefly Music Festival in Dover, Delaware this past June, and had grandiose plans of returning a music festival convert, excited to catch the bug and tackle the next one. I still like to think of myself as someone young, fun, and up for anything, even though the reality is that 30 is approaching at a rapid pace, I have to admit I do like things a certain way, and truth be told, I’m requiring a lot more sleep then I used to. My sole purpose of going in the first place was to see The Killers, one of my all time favorite bands, whom I’d never seen before. While I’m a huge music fan, The Killers are one of the only artists in which I can listen to the entire album, back to front, and know almost every word, to every song, even the more obscure ones (more people need to really acquaint themselves with “Dustland Fairytale”). I’ve watched their live concert at Royal Albert Hall in London more times then I can count, and I was fully prepared to openly weep in public after hearing “Read My Mind,” a song that routinely both gives me the chills and evokes a beautiful sense of collegiate nostalgia, for the first time live. The Killers were set to hit the stage Sunday night, but by Sunday afternoon, I was sunburnt, wet, delirious from sleep deprivation, and needed to get the hell out of Dover. While hardier revelers enjoyed The Killers on what turned out to be a gorgeous Sunday evening, I laid in my king sized bed at a Holiday Inn in Lansdale, freshly scrubbed, contentedly finishing up season 3 of Orange is the New Black. I did say “may not be” a music festival person, because looking back now, with regular sleep, regular showers, and being blessed with the regular use of porcelain thrones from which to relieve myself, back in my life, I think I would attempt another festival again. 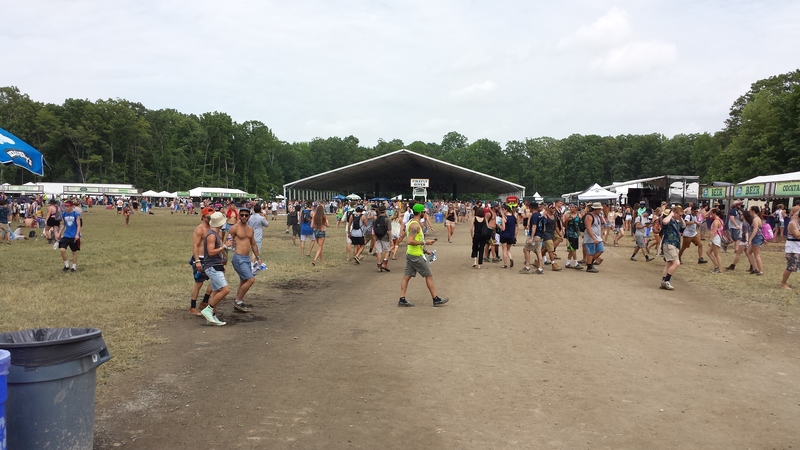 I have fond memories of my time at Firefly. I’d just make several adjustments as to how I did it. I’m getting ahead of myself here, though. 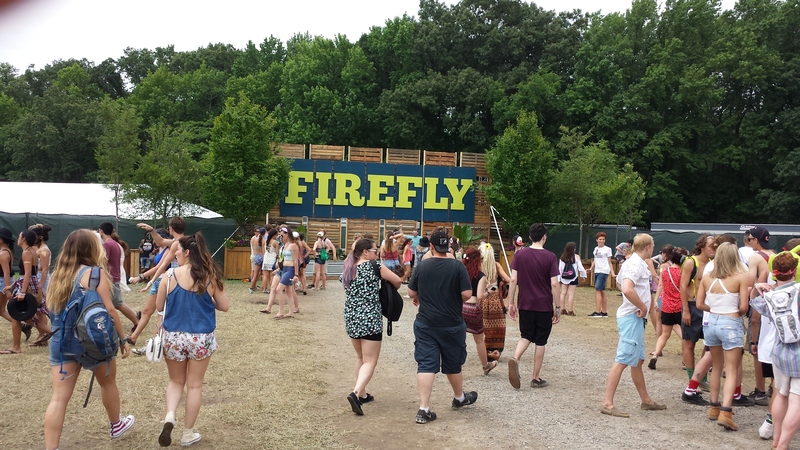 Firefly, founded in 2012, is an annual music festival held near the Dover Speedway every summer in Delaware. It’s a four day festival, Thursday through Sunday, and this year was being headlined by Paul McCartney, Kings of Leon, and The Killers, who again, were my main draw. I’m not the biggest Beatles fan out there, but I respect what they did for music, and was excited to see Paul McCartney. I actively like the Kings of Leon’s music, but they happen to also be one of the most disappointing concerts I’ve been too; they basically played their album in the same order the CD was laid out in, and didn’t talk at all between songs-I literally could’ve just listened to their CD in my car and would have had a similar experience (not worst though, while the concert was lukewarm at best, we scored tickets to the VIP bar that night and ended up having an amazing time-I somehow convinced 2 sorry souls that I was a cage fighter from Australia despite the fact that I rocked a noticeable beer gut at this time and that my “Australian” accent sounded more like it came from Southie). There were a few other bands I was wanting to see, but otherwise I was excited to possibly see some new acts, camp for a few nights, and just take in the festival atmosphere. I was planning on doing just Friday-through Sunday as I didn’t want to use all my vacation days in one place, and there was no one I really wanted to see Thursday. I spent that night in Philly, so was able to be in Dover by 9:00 Friday morning. At the risk of sounding too negative, despite SPFing regularly I think I was pretty badly fried by noon. If you recall by last summer’s Cape Cod/Martha’s Vineyard extravaganza, I’m simply not built to be in the sun for long period of time (shout out to that Irish, Lithuanian & British heritage-you guys are strong in the hollow leg and eyebrow game, but weak in the sun exposure). It turned out to be a very hot weekend (85 plus degrees every day) and if we weren’t at the campsite, there was little respite from the sun’s rays. You see, it rained pretty badly Thursday night, and while the direct sun did do a decent job of drying up all the mud in open fields, any shaded area was pretty much still a swampy mess, so it was either dry ground in the sun, or shade and mud (which wouldn’t have been an issue if there was somewhere to sit). 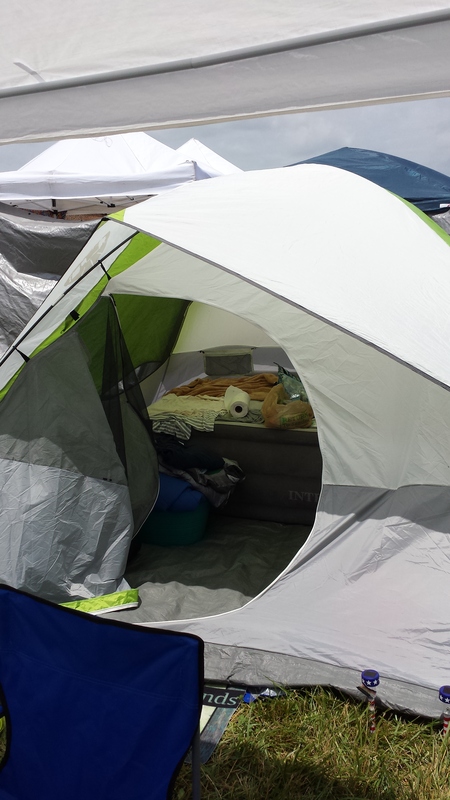 We did general admission camping. Festival attendees are given a few different options. Obviously, GA being the cheapest, is the most popular. You’re given a lot that can hold one car, and several tents (we comfortably had 2 and a canopy set up on ours). You can also do RV camping, or premier camping, the difference being that with premier you’re located adjacent to the festival grounds, while we had about a mile walk. There’s also a “glamping” option, which I’m sorry, is one of those words I just hate on principal. If we ever went again, I’d probably want to rent an RV or at least do premier (or maybe stay in a local hotel with hot water?). After parking and a very long walk across the campsite, we settled down under the pavilion and started pregaming the concert. It was a fun atmosphere, and the excitement across the campsite was palpable. While we were playing beer pong with the guys next door to our site, my buddy’s wife came back from the showers. She’d waited in line for almost four hours and had to pay to use them. I decided at that moment that I’d be doing a no shower weekend. I figured it’d be no big deal. I’d done it camping many times before. The difference here is that I’ve normally done it in close proximity to either a pool, lake, or river, and so even if I was showering, was able to water myself down. By Sunday, I felt disgusting. 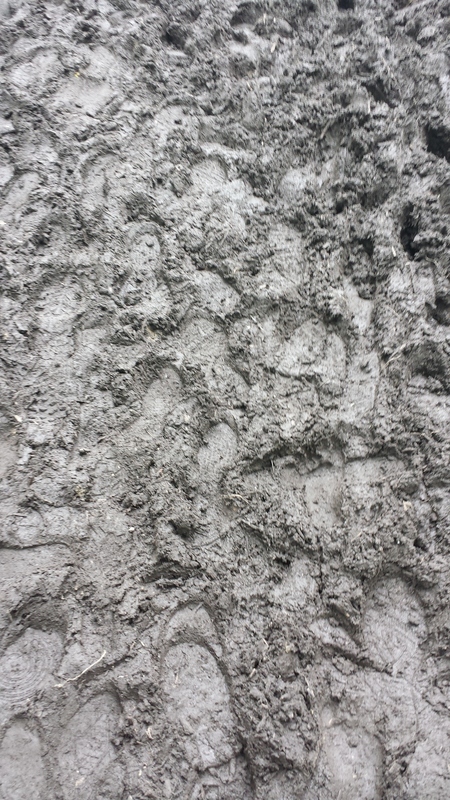 You’d think the rain would’ve helped, but with this rain came a lot of mud. In fact, when I finally did get to washing myself off Sunday night, I think I straight up ruined all the wash clothes and towels in my hotel room. I was that dirty. I thought that the festival itself was set up really well. There were 5 different stages where acts played, as well as “The Pavilion,” a covered stage and dance floor specifically it seemed, designed for the DJ/EDM set. I have to be honest, EDM is a category of music I’ve never gotten into, and really just don’t get. I always was under the impression that it was more of a niche type genre, so was surprised as to how popular these acts were and how many people seemed to come specifically for some of these guys. I also have to admit that the people in the EDM tent did look like they were having a lot of fun. That’s the EDM “Pavilion” in the background. I also liked the amount of things to occupy your time with if you weren’t watching a show. There was a beer arcade (not my thing, but I think it was cool they had it), quite a bit of shopping (again, something I didn’t participate in because I was already spending a lot of money), and a “hammock hangout” in the woods if you just wanted to rest (which we didn’t venture into because of the already mentioned mud, and the line). Before I go into the two “attractions” I did spend some time in, I also have to hand it to the food vendors. Everything I ate was delicious, and while it was definitely concert priced, the portions were decently sized and wasn’t grossly overpriced. While I mainly stuck to hamburgers, I did have an amazing pulled pork sandwich (I’m realizing the older I get, how many bad pulled pork sandwiches are out there) and am a new sweet potato fry convert. The amount of options available though, was impressive, with German braut stands, Thai food, pizza stands (with more then just cheese and pepperoni), and bbq joints. 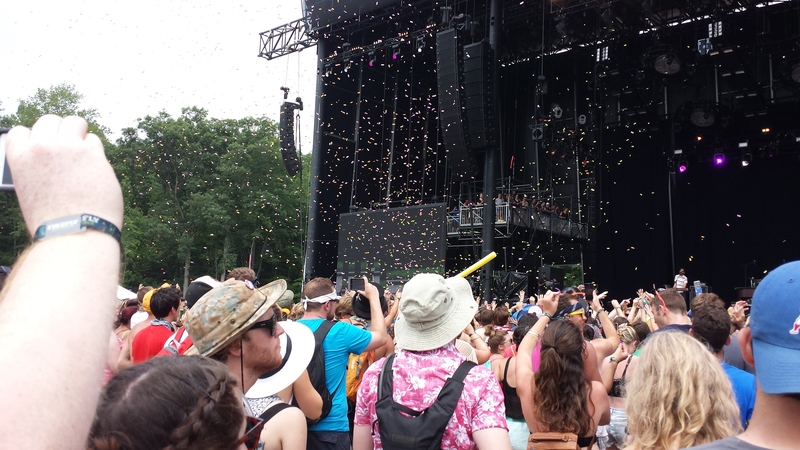 Confetti during Andrew MacMahon. It was magical, but not as magical as the napkin confetti that falls at the Dead Dog during last call in Sea Isle. 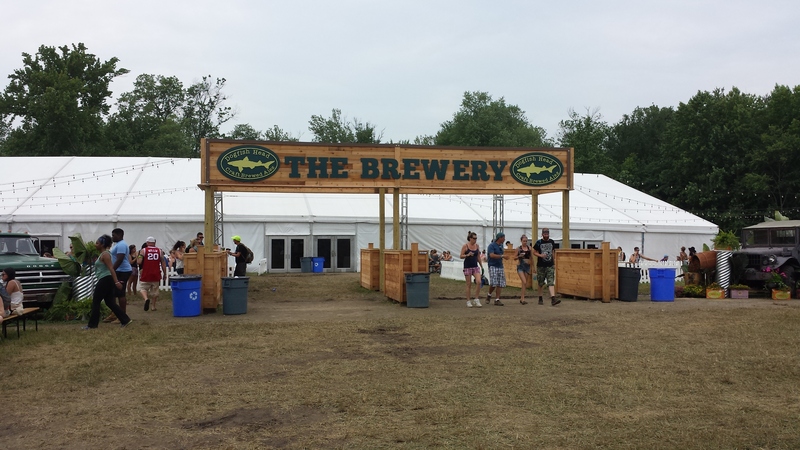 The two places I really liked were the Dogfish Head Brewery and “The Thicket,” a “silent disco” that initially had me rolling my eyes hard. 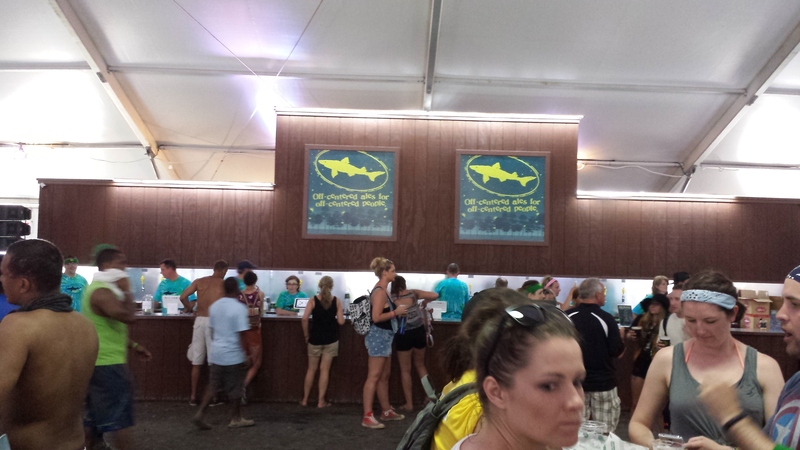 Dogfish Head, located in nearby Rehoboth Beach was great because it was actually air conditioned, had a really good DJ inside, and brewed a “Firefly Ale” specifically for the festival, that I really enjoyed. I spent way too much time there Saturday afternoon, which is precisely how I found myself at the “silent disco”, a wooded area in which you were presented with a pair of headphones, which cancelled out the noise of the concert and allowed you to dance in the (at this point extremely muddy) forest like no one was watching. The first song on when I donned my headphones was “It’s Tricky” by Run DMC. I was sold. Where I spent WAY too much of my time. Back to Friday afternoon though, I had to go back to the campsite for a bit of a nap as I was completely drained after dinner. The sun had gotten to me, I was dehydrated, and my contacts needed to come out. I returned in time to see Paul McCartney around 9, and I have to say, walking into the festival at night was, and I hate to use this word, I really do, magical. The whole place, is obviously dark, but all the trees and forested walkways are decorated with all sorts of multicolored lights, projection screens, and fog lamps. It was very cool backdrop to watch a concert in. I was impressed, and the only mind altering substance I was drinking was Coors Light, so I could only imagine how much the people on drugs loved it. That’s another check against the festival experience. I think I’m getting too old for rampant drug use, and for people who can’t handle their alcohol in public places. The sheer amount of people who were just beyond out of their minds was insane. I can tell you, as someone who does enjoy his drinks, I cannot fathom why people want to lose absolute control of all their faculties. It doesn’t look appealing, and frankly is scary. The amount of people around us who were just well, zombified was amazing, and the amount of randos just reaching out and touching others was bothersome. I mean, midway through “I’ve Just Seen a Face” (one of my favorite Beatles songs) some girl took of her pants and peed like a dog in front of us. Later, during “Hey Jude,” I saw a guy shitting on the ground. I repeat, he was just publicly SHITTING ON THE GROUND DURING A LIVE RENDITION OF “HEY JUDE.” That being said, Paul McCartney was amazing to see-and impressive when you realize how old he really is. The game changer was the rain. On Saturday night the concert grounds were actually evacuated due to a tornado warning. It poured, and our campsite was pretty much flooded. When the sun finally came out early Sunday, it took me a good hour to pick all my soaking wet, muddy clothes and belonging out of the tent (I’d left my suitcase open like a jackass). By this point, I was sunburnt, had very little sleep in the past two days, had no where dry to lay down, and no dry clothing options. Basically, I was tired, cranky, and wanted to shower, and the only song I really wanted to listen to at that moment was “Sloop John B.” when my friends decided they were ready to head home and abandon the rest of the festival, I was 100% on board, even though I’d miss The Killers. It was a weird mix of relief and resentment when I finally checked into that hotel, too exhausted to drive anymore. The shower, king sized bed, AC, and room service hamburger (over priced, AND delicious) made me feel human again. I also felt like an old fart who couldn’t hang, especially when I noticed how beautiful the sunset was, and imagined how beautiful a backdrop it would’ve been to The Killer’s live set. But you know what? I am getting old. The though of having to sleep outside one more day, wake up the next morning with no sleep, and make it to work by 2 did not seem worth it. Now that some time has passed, I think I’d venture back to a music festival. The memories I have of it are fond, and I got a couple of good stories to add to my catalogue. But I also came to the realization that buying a six pack of Dogfish Head here in NEPA, watching youtube videos of the Killer’s set, and keeping my window open so that I could take in the sunset does not make me a loser. It makes me an old fart.